The other day was Valentine’s Day. The day before that was my 14th wedding anniversary. And the day before that I spent an hour staring into the brown eyes of not one, but two lovely young men, neither of whom happened to be my husband. 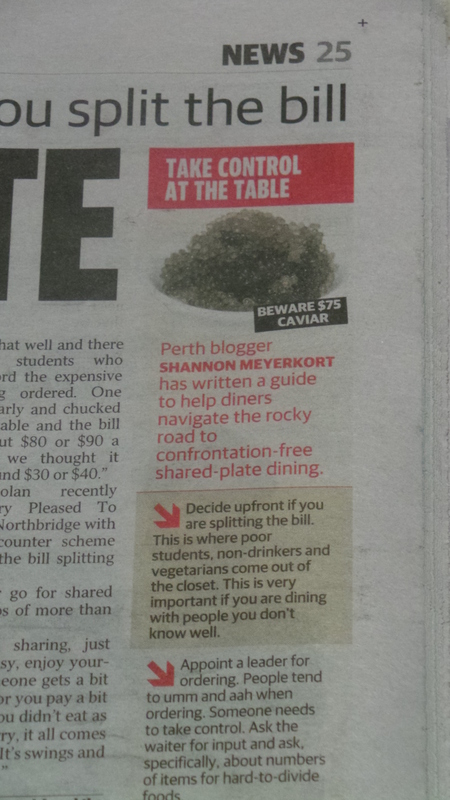 In Perth, there are two main food critics. Rob Broadfield writes for the West Australian, while Gail Williams writes for the Sunday Times. I read both their work with interest, not only to find out about new places to visit (or avoid), but because I am interested in the craft of reviewing. That’s what I do. In October last year Gail Williams finished a review lamenting the fact there needed to be an etiquette guide to sharing food. So I emailed her a link of my WeekendNotes article ‘Share Food Etiquette: Top Tips to Surviving the Share Plate Experience’. Although she replied promptly, she indicated she was going away and she’d contact me when she returned. When I hadn’t heard from her a few weeks later, I sent a gentle reminder, asking her if she had enjoyed the article, but when nothing more was heard, I decided not to the be crazy stalker person, and let it go. It felt like an opportunity had vanished, and I‘ll freely admit I was disappointed. So three months later when the phone rang on a Tuesday morning, I was surprised when it was Gail asking to interview me about the share food experience, and to let me know she was going to use my etiquette rules for an article that would run in the Sunday Times. Was that ok, and by the way could I come in for a photo-shoot? Oh, and there would be food. So this was how I came to be staring into the eyes of lovely young men, as four of us posed for a photograph to accompany the story. There was the ‘poor student’, the ‘big eater’, ‘the industry professional’, and me, ‘the expert food blogger’. We had met at Lallah Rookh in the city, a small bar and eating house I had heard of, but never visited before. At ten in the morning the staff were getting ready for the day, but when I walked in, the photographer was already there, table set, lights burning. With a delicious spread in front of us, we were told to pose handing each other dishes, serving ourselves food, twirling forks in the pasta. I twirled my pasta so much, I couldn’t get it off the fork to eat. So much parmesan was served, it looked like a small beach, and all the while two lovely tall frosty glasses of beer stood untouched in front of us. We were told to look each other in the eye and smile, something I normally don’t have an issue with. I like to look people in the eye, and I’m a bit of a smiler, but what I am not used to (I came to realise, while already hot and sweaty under the lights) is looking for an extended period of time directly into the eyes of men. I probably don’t look into my husband’s eyes for an extended period of time, unless we are trying to pass telepathic messages about the kids to each other. Maybe that’s something I need to work on. I got a bit flustered looking at the owner of the bar that I ended up dropping the head of the prawn I was meant to be offering him, thus splattering smoked tomato salsa all over his hand. I’m hoping that won’t be the photo they end up using. Some expert. 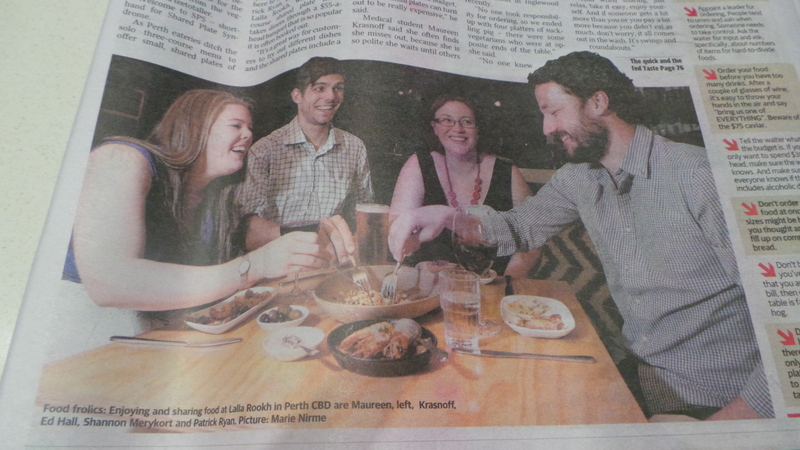 The story was published today, and sure enough there is a picture of me staring through half-closed eyes at another man. I swear, it was the chicken pasta I was in love with. It’s confronting seeing yourself in a picture someone else has taken. It’s even more confronting seeing what happens when someone else uses your words. But as a writer I have done it myself. People offer you a story, usually full of pauses and gaps, backtracks and corrections, and as writers we smooth it over, alter it slightly to read better. But the words are no longer your own. You might have said it slightly differently, or focussed on something else. It is something I will need to remember for all future articles where I quote other people, to listen between the lines, and be sensitive to what they are trying to say. What I write might not be what they were trying to say. I had hoped that a link to the original article I wrote would have been included in the article, but with a name like mine, I’m guessing people will find me if they really want to. Just in case, here is a link to the original story I wrote. And for the record, I really am in love with the roast chicken pasta we twirled.